Some of you may be familiar with various martial arts. There are different types from different Asian countries. My daughter asked and asked to take some classes for years. We looked at a few schools in the area, but many were out of our budget range. Meanwhile, we continued to struggle with our daughter's lack of focus, self control, discipline, and overall greater awareness of her surroundings. We also found it hard to keep her active and fit in the winter months. A few years ago, we finally came across a school that was very affordable and had no contract obligations. The school taught Aikido, a Japanese form of Martial Arts that involves defense only. It doesn't include hitting or kicking. Their only kids class had kids as old as 18 down to my 6 year old. The school was VERY strict and structured. And everything was VERY "quiet" (no grunts, sighs, whoops, chatter, just quiet deep breaths). Again, this was what I was looking for (right?) But even as we were signing up at the front desk, red alarms were going off in my head. My daughter (6 at the time) started getting ancy and talkative in her excitement, and the female sensei registering us kept glowering at her. My instincts were telling me that maybe this school was not patient or adept enough with very young children. But I thought, maybe this is what we needed for our daughter? In theory, this sounded all good, so we started going. The female sensei who signed us up ended up being the kids class instructor. (Oh, Joy!). The school seemed more interested in the way the kids swept the mats, bowed and walked on and off the mats than really teaching. I know that strict ritual is a part of any Martial Art. However, I noticed my daughter was struggling with a lot of the moves, and the teachers were spending more time with the older kids that showed more promise than the younger, fiesty ones. Even after a month, my daughter was doing her rolls all wrong, hurting herself in the process. Then the kid's sensei became injured, and things went from bad to worse. They had a new sensei teach the kids class. This sensei was a bulky, 6'7" bald man with a fu man chu. This guy would scare you in the street if you met him. He had a booming voice and he had NO PATIENCE for small, young children. I let my daughter go to a couple more classes and became so uncomfortable watching that I decided to pull her out of the school while she still had a willingness and passion for Martial Arts... and before I let this school and new sensei sour her to quitting all together. So, we took a break, let the recession pass and did a lot more research. We finally found a great school for my "little ninja". They divide the classes by appropriate ages. Teens are in teens. Mid-grades are together, and the little ones are totally separate. This school is a blend of Karate, Taekwando, Aikido and some others art forms. So there is a lot more sparring, punching, kicking and footwork than just defense and rolling. The school is strict, but it is done with a warmness and genuine care for the kids. And the class is LOUD! They yell a KI-YAY with every move, forcing them to breath and gain confidence. The children also bring home a job sheet they hand in every month, and this forces them to bring the culture the school teaches into their daily lives. In fact, they cannot get a belt promotion without these job sheets. My attempts at having my daughter help with chores around the house has failed until this job sheet. She finds it so important to move to the next belt that she makes sure she is getting check marks on that job sheet. Some kids value money, so allowances work. Some need other rewards. Some just inherently like to help. But if you have struggled, like me, to get your kid to see the big picture, I urge you to research Martial Arts as a way to help your child do just that. I have really seen a change in my daughter. Because they teach the children how to welcome each new student and make them comfortable, I now see my daughter go up to kids she doesn't know and introduce herself properly. She has become a great host when there are kids at our home. She makes others feel welcome and is willing to share her things more readily. She helps around the house. Her grades have gone up and stayed up. She has much more respect towards adults. She is getting more fit and strong, and has greater self control over her body. It really is worth the money we are spending. - Is the school within budget? Do they have value added services to warrant the price they are asking (our school allows the whole family to use the workout area any time we want, so it replaces a gym membership). - Are they asking for a contract? Are you comfortable with that? Do they allow a no obligation trial to see if you and your child like it? - Do the teachers seem firm yet patient with the children? - Do they divide up the kids and skill levels appropriately Or are all kids and skills lumped together? If so, do you like that or not? Are all kids getting the attention they need? -Knowing your child's personality and physical nature, is the Martial Art they are learning a right fit for them? For instance, my daughter is big and strong for her age with a lot of energy. Aikido had a lot of throwing and rolling on the ground which was very hard for her size and weight. But with her strength and balance, kicking and jabbing in Karate is right up her alley. Assess your kid's talents and together, pick the right one for him. - Do the classes fit in your schedule? Are they flexible with make-ups? - Will the school let you watch a class? How do the children behave with each other? Are the teachers watching so the children don't hurt themselves? How do the teachers discipline, and are you comfortable with it? - Is the school culturally about "quiet" and self control with your voice, or is it loud- allowing kids to express themselves during their moves? Make sure your kid will be OK with either one you choose for them. 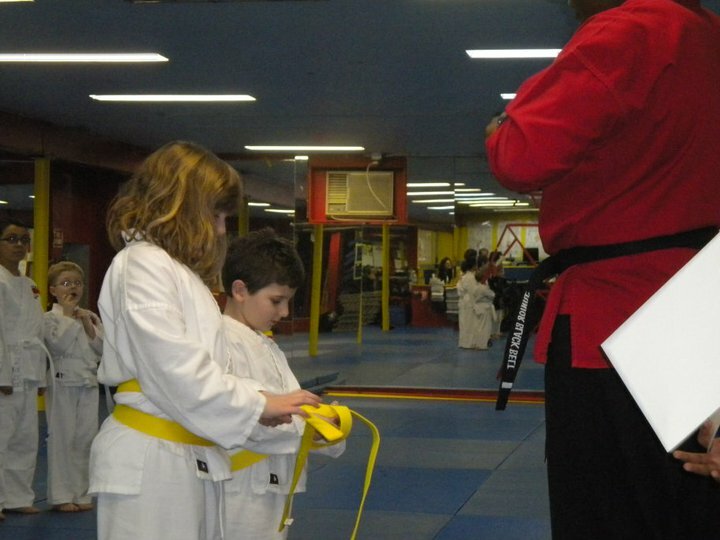 - Does the belt promotion system seem fair and attainable? Every school does it differently. If you take your time and find the right school and style, you will see a wealth of benefits for your child, I promise you! I know we have!